I'm a fan of post apocalyptic worlds for PC's to visit and its quite easily one of all time favorite things to do is to drop adventurers into the deep end of the wastelands. The one element that many post apocalyptic landscapes have regardless of genre have from the zombie apocalypse to a Gamma World 'years of shadow' style adventures is corpses. An often overlooked and under utilized game element. Well no more! 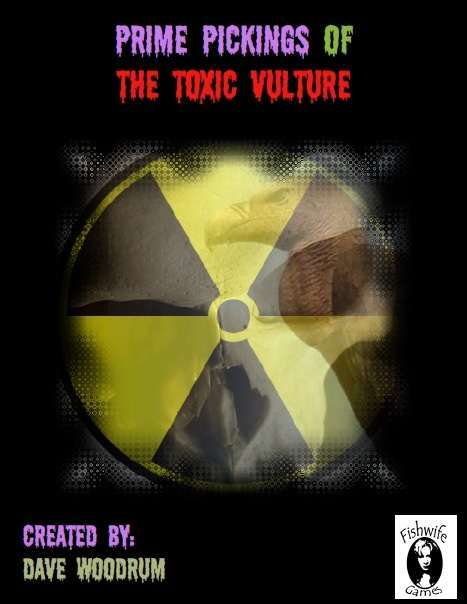 Dave Woodrum that one man factory of old school goodness from Fish Wife Games has produced two sets of Prime Pickings Of The Toxic Vulture series I & II. This is a sick and twisted idea, basically these are a series of two corpse filled booklets with all kinds of background on the corpses. Sweet mother why didn't I think of this??! With the popularity of the Walking Dead television series this is a really a nice little tool kit for running a post apocalyptic urban, wasteland, or deep wasteland adventure encounter with your favorite location filled with these corpses. They go for one fifty each and their a really nice addition to the arsenal of a post apocalyptic DM's tool kit. The Rules Are Simple... If It Is Lying On The Ground And Totally Dead Then It Is Your Right To Pick It Clean. This supplement product is a perfect companion for various post apocalypse settings. Whether your setting and gamers happen to favor zombies shambling across a parking lot filled with dead bodies or a post nuclear wasteland where small survivor settlements frequently fall victim to merciless highway marauders. Regardless of what your post civilization poison of taste happens to be, we have the dead and decomposing victims to suit your needs. Covered in each of the 13 selections is a given “name”, a general description of what the individual looked like in life, the clothing on their backs, and a listing of basic gear that they still have on their decaying carcasses. But is it good I can hear you saying? Yes its very well done actually and very useful because there are weird avian corpses as well scattered throughout these products. Suddenly these go from being simply an encounter with some corpses to your party entering into the twilight zone. Rosa Adult Latino female in her late 50's with graying dark hair and dark skin. Rosa weighed roughly 120 lbs and was 5 foot, 4 inches in height. Clothing: Dark blue dress jacket with an off white satin blouse underneath. Gold 14k wedding ring, Long dress skirt with tan nylons, fake leather dark blue belt, and dark blue high heeled dress shoes. Gear: 1 Pair of prescription glasses. Pocketbook containing flip cell phone, 1 tube of maroon lipstick, 1d4 Maxi pads, 1 pack of stale gum, 1 nail file, 1d12x$5 in cash. Its all in the little details which provide a DM with the adventure hooks he needs to begin to round out an adventure quickly and very concisely in the details. Suddenly this is no longer simply a corpse to raid but a human being. Does Rosa still have a family and are they alive someplace out in the wastes? Would they like back her personal effects and to know how and where she died? There are opportunities for a DM to link into an adventure. If there are family has mutation cropped up and what links might be gained from a search? With mutations such as the ability to read the past of the dead, the sky suddenly becomes the limit and I know that there are number of old school post apocalyptic games with exactly that sort of a power. The PC can literally read the past of the dead opening up all kinds of routes for a dungeon master to explore and exploit. Because many of the post apocalpytic Fish Wife products are system neutral they can easily be slipped in the back door of a campaign system like the retroclone Mutant Future or even the grittier comic book styling of the Mutant Epoch rpg. Corpses are mysteries in the wastelands with adventures just waiting to grab your PC's and pull them into their world. This is where Prime Pickings Of The Toxic Vulture I & II will provide you with an instant toxic touch stone for your adventures out in the wastelands. Is Prime Pickings Of The Toxic Vulture I & II worth your time and energy as a source of corpses out in the wastelands? I think so, with the right approach these resources can provide a DM with all kinds of CSI style possibilities.